Vintage 1968 LOUIS MARX & Co. Jane Apollo action figure toy (similar to the Johnny West series but smaller) mint in the original box UNUSED! 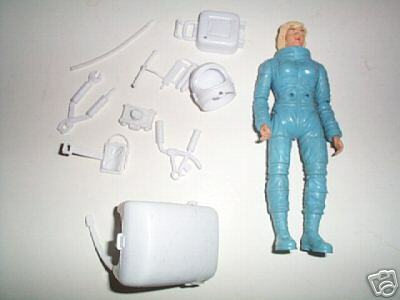 NOT A REPRODUCTION, This space toy features a working Jane Apollo in a blue space suit with perfect painted facial details! All joints work easily with no breaks or cracks. The white, plastic accessories are mint and sealed in the clear bag so you know they are complete and unused! Even the decal sheet and instructions look mint with NO YELLOWING. The figure measures 7-1/4" tall in a wonderful, photo-illustrated box that measures 5-1/8" x 8-3/8". There are no split corners or edges but one corner (top-left) has a small sliver of hanging paper that looks to be a victim of a careless employee's box-cutter when stocking the store shelves long ago. The boxtop has a piece of clear adhesive tape on the tip of the rocket and the "T" of "ASTRONAUT". There is also an upsidedown-bird shaped white surface tear (top-right) that is in the blue sky area. The top picture shows a crease that runs vertically through the image of the air tank she is holding. The right side panel has a 1-1/2" diagonal tear as well. These flaws I mentioned are hard to notice and really look minor when you consider how thin and cheap the box cardboard is. Multiple purchases always get a combined shipping rate. Postage will be $7.00 within the usa and $15.00 to most overseas locations. Insurance extra (if desired for domestic orders only). Please ask any questions within 2 days of the auction closing to allow us time to respond. This item is being sold as described and we will not be able to take returns based on condition unless defects were overlooked. PLEASE WAIT FOR US TO NOTIFY THE WINNING BIDDER. We accept Personal Checks (held for approval), Cashiers Checks, Bank Cheques in U.S. Funds and Money Orders ONLY (other means of payment will need pre-approval). Sorry, we DO NOT accept Pay-Pal. Thanks for checking our other auctions from time-to-time. This is indeed one of the most difficult boxed pieces to get - it always goes for a lot. I had to have been short-packed in an assortment (the usual ration males/females for these types of toys if 4:1) but I haven't seen any doc on it. OSS versions of any JA items are extremely rare - seems a lot of kids actually played with these toys. Even the instruction sheet is tough with this set. 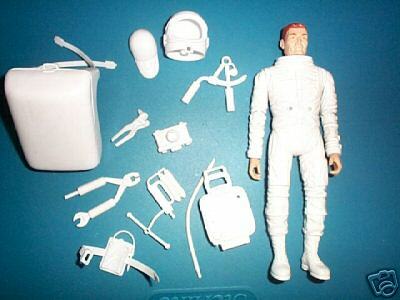 Vintage 1960's Marx UK Mark Apollo astronaut doll. He has red hair (compared to the US Johnny Apollo which has brown). Mark has the same head mold as Johnny, with Marx Great Britain stamp on back vg. cond. Vintage UK Marx, not one of the recent Mexican reissues! Check my other auctions! This is a really unusual variation of Mark - he's usually found with an orange moulded body and a different head (with the same red hair). The best thing about this auction is that he looks complete with all the white accessories. Original 1960's vintage Marx Jane Apollo astronaut doll. FACTORY DEFECT, SHE HAS TWO LEFT LOWER ARMS AND TWO LEFT HANDS, SOME IDIOT AT THE MARX FACTORY RIVETED A LEFT LOWER ARM IN PLACE OF THE RIGHT ONE, AND GAVE HER TWO LEFT HANDS? Otherwise good condition. Check out my other auctions! This is a fairly typical price for a loose Jane with as many accessories - usually loose good figures go for $15-25 - I think the number of accessories brought the price up to normal, even with the defective arm.